Which Politicians Want to Legalize Marijuana in the 2016 Election? Here are the 2016 Presidential candidates who are the most likely to legalize marijuana in the next election. Marijuana legalization is a hot topic for 2016 Presidential candidates. For decades, politicians have been debating the war on drugs in America, but 2016 may be the year that we elect a President who will stop the war on marijuana. The public has spoken—we want marijuana to be federally legal. Here are the 2016 Presidential candidates who look favorably on marijuana legalization. “In my view, the time is long overdue for us to remove the federal prohibition on marijuana”. At this point in the race, Senator Sanders is the only viable Democrat who has voiced undeniable support for full legalization of marijuana. Clinton is a supporter of medical marijuana. However, she believes that legalization should be in the hands of the individual state. She cites Colorado and Washington as successful experiments with legalization, but believes we need to do more research on the effects of marijuana use. Clinton wants patients in need of medical marijuana to have access “under appropriate circumstances”. This seems like a “half supportive” stance. On one hand she is supportive, but on the other she clearly has an opinion about what “appropriate” circumstances for needing marijuana are. Paul was famously given a jacket made of 100% hemp, by a supporter in Las Vegas. He quickly took his jacket off and replaced it with the hemp blazer. A true supporter! The Donald has made waves as a businessman for years, now he is tackling politics with the same bravado. His support for marijuana legalization could barely hold a marijuana plant up during flowering, but at least he is willing to walk into the grow room. Trump believes recreational marijuana use should not be legal but he is in favor of legalizing medical marijuana. Trump said,“We’re losing badly the war on drugs. You have to legalize drugs to win that war. You have to take the profit away from these drug czars”. Trump supports allowing states to vote and decide if they want to allow medicinal marijuana use, but remains skeptical. If Trump’s past behavior is any indication of the future, he will begin to support full legalization as soon as he starts benefiting financially. 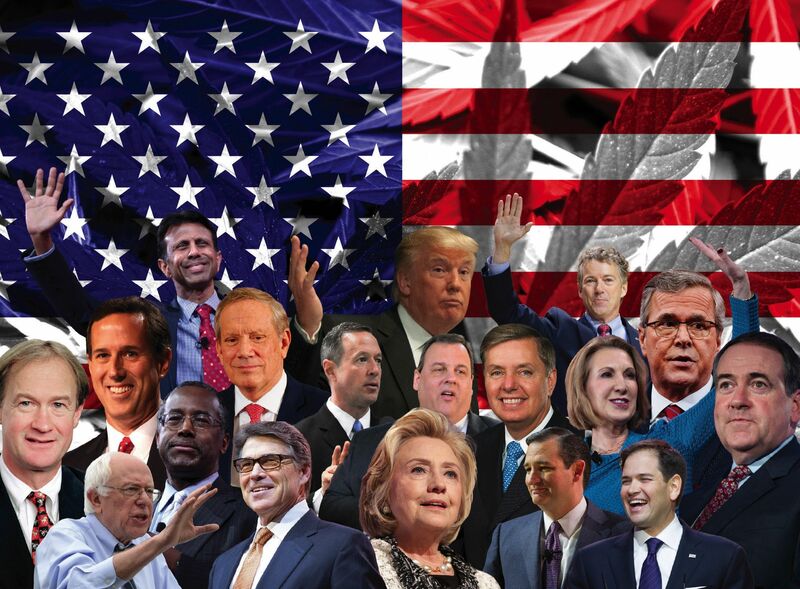 The candidates above are some of the most relevant in the 2016 Presidential race. Other, possibly more supportive, candidates have dropped out of the race. We are just days away from the last year of President Obama’s time in office. Some are calling next year’s presidential election the “marijuana election”, so be sure to follow the news and get out to vote! Who do you believe will legalize marijuana in 2016? Let us know on social media.